I wanna say my interest in Kabuto started waning around when the Hopper Riders showed up. Not that they were at fault, it was just the easiest thing to point to. Honestly I did really like at least the first half or so of Kabuto. Though I kind of think the focus on Tendou is what hurts it the most for me. I'm on fourze now and the teacher getting banished and off the show seemed out of place. She seemed like she would be around for the whole season. I'm on episode 21 or so and waiting for it to really take off like gaim. I hated gaim for the first 15 eps then it got better, but I thought the ending was dumb. Couldn't Mai just give kouta the fruit? Or was it because she went back into time, she was locked out of giving the fruit to someone until there was only one left standing? is that when she disappeared to the other planet? Or the whole Daisuke and Gon characters that are seemingly a big deal, and he's actually a Kamen Rider, then they're kind of abandoned until the finale episode where they make a token appearance? Yeah, the actress got really sick and couldn’t continue filming, so the show had to work around that despite her being incredibly important to the story. Drake’s actor was a popular idol at the time, which is why he kept leaving the show for long stretches of time. ahh, I guess that makes sense. I hated gaim for the first 15 eps then it got better, but I thought the ending was dumb. Couldn't Mai just give kouta the fruit? Or was it because she went back into time, she was locked out of giving the fruit to someone until there was only one left standing? As I recall it was because she was stuck in a realm in-between time and space due to Ryoma cutting out her heart to try and get the golden apple, and she couldn't come out until a victor was decided and claimed the apple. There was also the fact that she didn't want either of the two to die. So she went back in time to try and stop Kouta, Mitchy, and Kaito from becoming riders. But because the fruit's power or something, she couldn't directly tell them not to become riders. And her warnings ended up being really vague so the three ended up becoming more determined to join the battle. Pssst.... The "or something" is Gen Urobuchi writing himself into a corner by not properly thinking out the long-term plan for those warnings when they first happened. 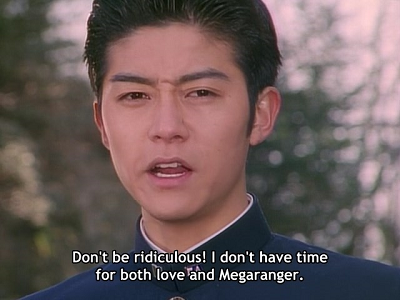 I'm 5 episodes into Den-O. It's a pretty silly show. Momotaros is awesome though! His swagger and mannerisms me of Blood Stalk, but cooler. Den-O was my first Kamen Rider season, it's pretty enjoyable. Just don't expect a plot, there is none. Den-O is a really fun show. If you like the humor you'll really enjoy it. I have to watch it. Just need Den-O, Kiva, and Decade, and I've seen all the Heisei Rider shows. ..need to decide whether to watch 'W' again or jump right to 'OOO'.